We are in the first inning of the MLB season with opening day a month or so behind us. With that as a backdrop, I thought it might be interesting to dig a little into where MLB teams were most active on social media and who was leading the pack. This data is still in its early days, but some interesting things pop out that you also might be able to apply to your own social media strategy. It became clear from a couple of data points that MLB itself has a lot to say about how baseball teams are set up online. Look at the sample of homepage images below. Clearly, every team in the league is presented in the same fashion, with the few changes allowed being colors & logos. Look at the the channel matrix below. I have to believe that someone at MLB has mandated which channels teams can be present on and which they will not (sorry, YouTube!). This essentially defines the field of play on social media for the MLB. Unfortunately, for the rest of us in businesses outside of MLB, the field of play isn’t always so clearly defined. Do you know what the social media field of play is in your business? A key first step in defining the field of play for your industry is first knowing “who is where”. Takeaway #1: Use a social channel audit, “who is where”, to define your field of play on social media. If we take a quick look at the total reach metrics for MLB teams, it becomes obvious that Facebook is where the action is for baseball. Now, we all know that reach and engagement are different things, so we will dig more into that in a second but I think a quick glance would tell anyone that a MLB team would be silly to ignore Facebook. Do you know what channel is the “Big Dog” in your industry? Things might not be as clear in your industry as they are for MLB in terms of which channel is dominant, but if you don’t have a view similar to below for your industry you probably want to change that. Takeaway #2 – Knowledge of who is doing what on the playing field enables you to define what your Big Dog channel should be and how to spread your investment in social media. A Google+ Aside: What’s Up with the Bay Area and Miami? Look at the activity level for the top teams on Facebook – they are in the neighborhood of 200 posts in 30 days, or 6-7 posts per day. That is a very active Facebook presence as compared to many businesses. Do you know the right activity level for your Big Dog channel? For MLB teams, it’s clear that high activity works for them. But how do you determine the right activity for your company? Experimentation, certainly, but make sure to use data from other players in your market to inform your plans around the appropriate activity level. Which MLB Team is Winning the Engagement Game on Facebook? We’ve figured out that for MLB Facebook is their main social media channel, so who is winning on social in the first inning? After looking at several engagement metrics, the Los Angeles Dodgers are clearly winning the Facebook engagement game. Whether measured by Total Engagement, Total Engagement Rate (Total Engagement/Fans), or Average Engagement Rate per Post, the Dodgers are out in front. I’ll save the detailed analysis of what the Dodgers are doing differently to engage their fans for another time, but the final message I want to drive home that is relevant to your business is what I would do if I was any team but the Dodgers: I would use this information as the starting point to examine posts from the Dodgers to identify tactics and strategies that I could use to increase engagement with my audience. I would also monitor the Dodgers’ online strategy very closely to determine changes over time. Do you know who is most effective in your market at engaging their audience? Are you using what’s working to inform your own tactics? Takeaway #4: Use engagement rate as a method to find the winner(s) in your industry. See what you can learn from what is working. 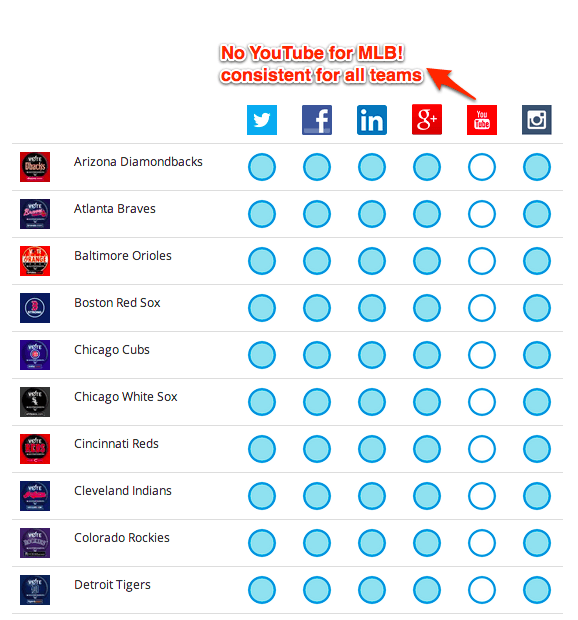 MLB has mandated consistency across websites and social media channels for all teams. This consistency makes it easy to determine that the Big Dog channel for MLB is Facebook. 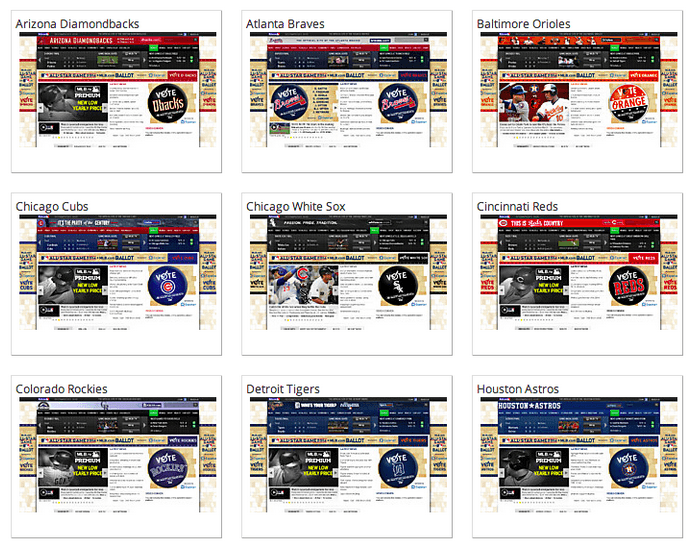 MLB teams on Facebook are VERY active; they post 6-7 times per day. The Los Angeles Dodgers so far this season are winning the social media game based total engagement and engagement rate. Use a social media channel audit, “who is where”, to define your field of play on social media. Knowledge of who is doing what on the playing field enables you to define what your Big Dog channel should be and how to spread your investment in social media. Use data and experimentation to determine the right activity level for your Big Dog channel. Use engagement rate as a method to find the winner(s) in your field. See what you can learn from what is working for them. So, what’s your Big Dog channel? How did you determine to maximize your investment there? Let me know what methods you use to prioritize your social media efforts in the comments. Note on the data and charts used in this post: All the charts and data from this post are from the Major League Baseball market landscape I assembled in Rival IQ (my company’s product). If you want to dig deeper into the MLB data you can create a free account and make a copy of this collection of teams by clicking here. This data is also publicly available from the various social networks.